/The intersection of art and technology is such an exciting place to be. It’s a common ground for those who don’t want to just pick one or the other. For instance, I came across an article on digital—“smart”—pointe shoes. These look to be a normal pair of ballet shoes which have a sensor attached and, when paired with an app, will read a dancer’s footwork and display the movement with airbrush-like strokes on the screen of your phone. Not only do I find this just plain cool, the creation offers itself a bold, new observation: Technology can be beautiful. Too often we are left with intimidating new technology that appears too scary and user unfriendly to the timid and, really, most anyone. Be it the actual appearance of a device—wires entwined everywhere, large gears and motors–or simply the disheartening realization by the user that underlying technology makes the device initially smarter than him or herself, something new can be something scary. 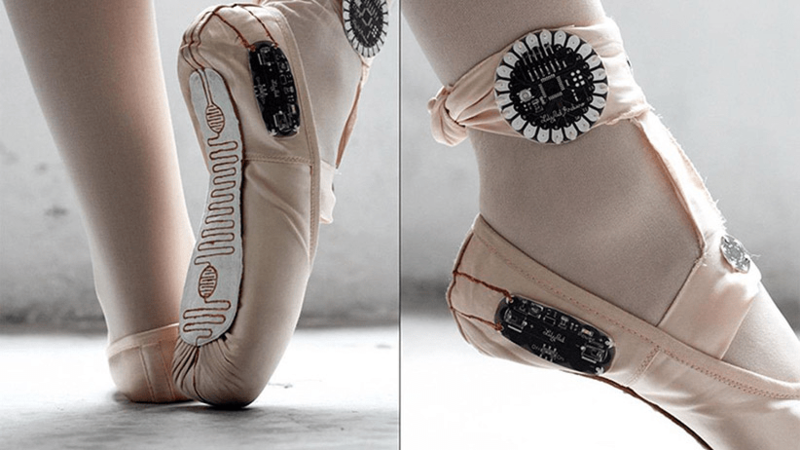 Intriguingly, these pointe shoes allow technology to present itself as not only pretty but also attractive and engaging. Not to mention what this means for the ballerina. How revolutionary is something that allows a dancer to see that she can feel strong and beautiful; high tech/cutting edge and classical. There doesn’t need to be one or the other. And this applies to more than just a ballerina or a girl, at that. Maybe for that “techy” who wants to add a little grace. Maybe that Barbie-loving child who wants to see something a bit more electronic. Just last week, I was enjoying a walk with my mom, and we passed by a little girl who was all dressed up in a dress with a crown. She informed us she was going to go out to eat that night. She turned out to be extremely talkative, telling us that she had Barbies in her garage—almost twelve of them—and that she knew everything. She even said she knew what we were going to say before we said it. I was taken aback by this young girl’s headstrong attitude. She was ultra-feminine with an appetite for adventure (and her awaiting chocolate dessert), and I think she would love to try those pointe shoes on. And though, typically, females are seen as ballet dancers, the idea is that when a product such as this is created, everyone can be affected or inspired by it. I mean, who—regardless of gender or age—wouldn’t want to see the shapes and movements they make when they dance? Crossing categories can be very effective both for individual imaginations and for the larger effort to increase diversity in fields related to science, technology, engineering and mathematics. I think it’s always exciting to see what spins on traditional fields can lead to next.